Colloidal particles are often directed to assemble by use of applied external fields-e.g. by exploiting particle charge or ferromagnetism, and by applying electro-magnetic fields to induce interactions and to steer the particles into well-defined structures at given locations. Here, we exploit fields that arise spontaneously when microparticles are placed in contact with deformable matter. In particular, we have been exploring energy stored in deformation fields around microparticles as a means of directing colloidal assembly. We do so in two contexts- exploiting capillarity at fluid interfaces and exploiting elastic energy stored in confined liquid crystals. 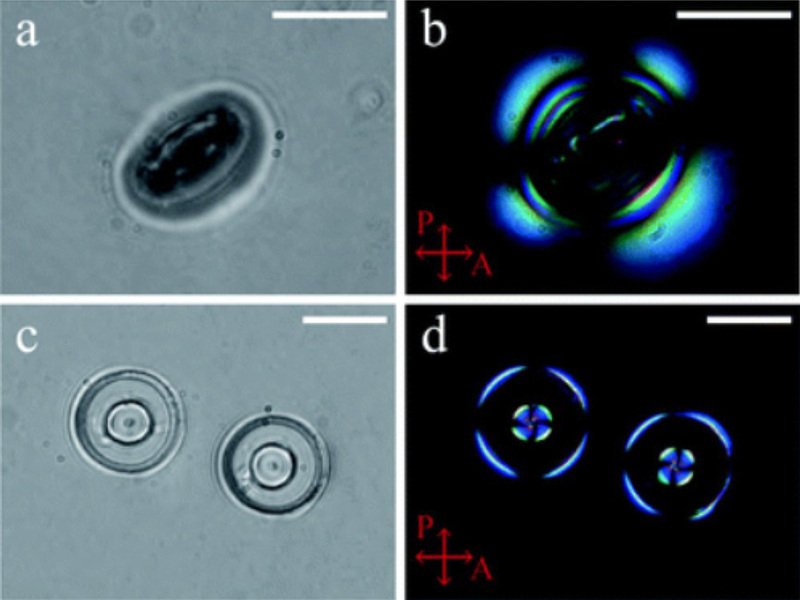 Shape of the oil–water interface around (a) an isolated microparticle and (b) between two microparticles of differing wavelengths, 36 microns and 60 microns respectively. The inset in (b) shows the corresponding shape of the interface in surface evolver simulation. We study capillary interactions that occur between anisotropic microparticles at fluid interfaces. These interactions originate in the distortions created by particles in fluid interfaces. The microparticles have undulated contact lines owing to wetting boundary conditions; the fluid interface deforms, creating an area field around the particle that bears the signature of the particle shape and wetting. The product of this area and surface tension is an energy field, which we exploit to direct particles to migrate, orient and assemble. We have emphasized the role of particle shape, although these ideas can be straight-forwardedly extended to address patchy or Janus colloids. Microcylinders at fluid interfaces assemble end-to-end into rigid chains, whereas ellipsoids assemble side-to-side into flexible chains. The mechanics of these assemblies can be related to the capillary energy landscape. Near field interactions can be engineered to be attractive or repulsive. On curved interfaces, particles surf along curvature gradients to assemble at sites of high curvature. We perform analysis and experiment to understand this migration. Recent work focuses on extending these arguments to migration of particles and proteins along lipid bilayers under tension. Liquid crystals (LCs) form states intermediate between liquids and crystalline solids. Their unique properties have enabled a wide range of applications, most famously in displays, but also in biosensors, photonics, etc. Here, we study LCs for the study of topological defects. We are interested in exploiting the defects themselves, and to use them to direct colloidal assembly, with applications in engineering of microlenses, and self-organized, hierarchical functional materials for new tunable and switchable optical materials. (a) Bright field and (b) polarized optical microscopy images of hybrid washers in a homeotropically aligned cell form only the outer defect ring c) Bright field and (d) polarized optical microscopy images of homeotropic washers in a homeotropically aligned cell forms both an outer defect ring and an inner defect. Topological defects are regions where the order of the LCs is not defined. Such defects are not only interesting objects because of their ubiquity in many fields of physics, from cosmology to superconductors, but they also have important properties in themselves. LC defects form at sites where the energy required to locally melt or become disordered is lower than the energy required to distort strongly. We use topographical cues and boundary conditions to create preferred sites for defect formation, allowing us to create defect and associated director fields with well- defined elastic energy landscapes. We are interested in topological defects from a fundamental viewpoint, and in exploiting the associated LC structures in a range of contexts, including optics and directed assembly. For example, we study focal conic domains in smectic LCs in the context of microlenses. The LC molecules in these defect structures are organized in nested layers that induce light focusing toward the defect core, so that the individual defects can act as microlenses. Lithographic features can be used to control the symmetries and sizes of the focal conic domains, thus creating self-organized, hierarchical functional materials that serves as new novel tunable and switchable optical materials. We also exploited elastic energies that arise in confined nematics liquid crystals for colloidal assembly. This energy can steer particles within the bulk or particles that are trapped at the LC-air interface. 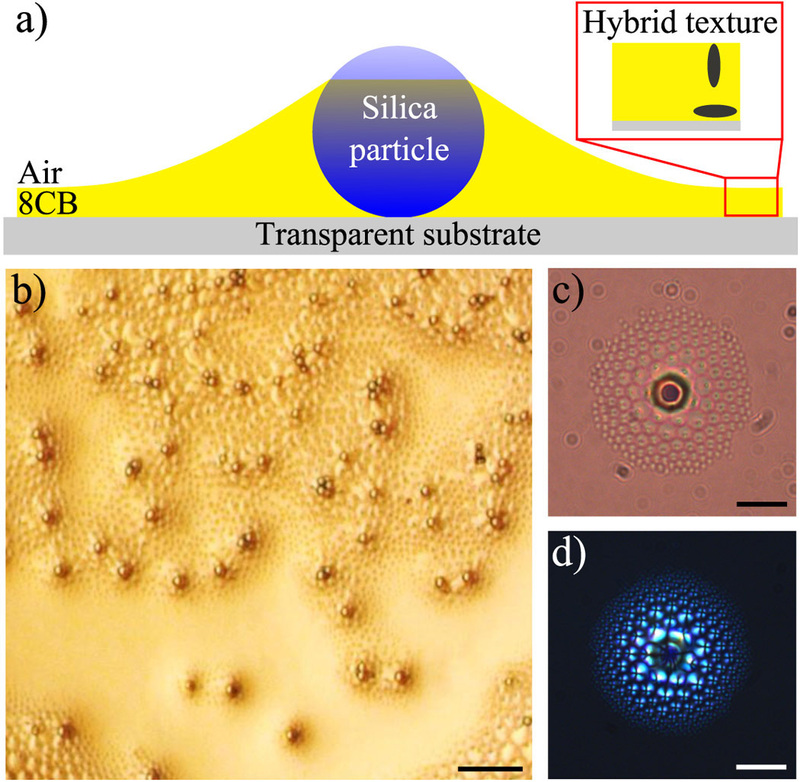 We explore this theme using topographically patterned solid surfaces to define defect fields that steer particles trapped at fluid interfaces into assemblies mimicking the defect texture. We have pursued related examples for particle migration in smectic films, with either free surfaces or on topographically complex surfaces.